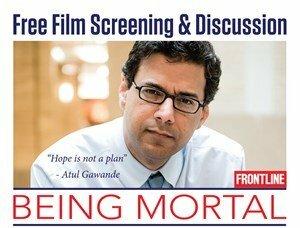 The PBS Frontline documentary “Being Mortal” (based on the bestselling book by Dr. Atul Gawande) explores the hopes of patients and families facing terminal illness and their relationships with the doctors, nurses and family members who care for them. The film will be followed by a discussion facilitated by Jane Lowers about end of life planning, health care proxies and other advance directives, talking with loved ones about end of life care, and communicating effectively with doctors. This program will be held at the Isabella VISTA NORC located at 11 Fort George Hill.